Light Guides for Front Panels IP68-rated. 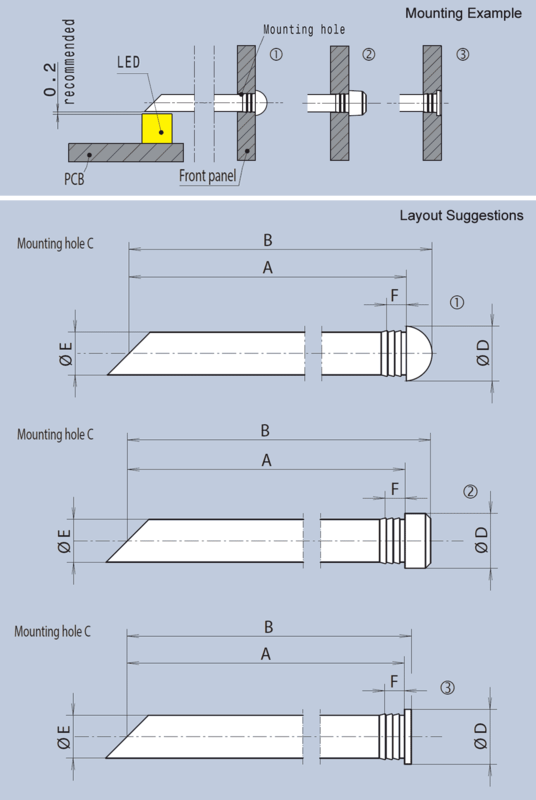 Spherical, planar or Counterbore heads. The original 1282.xxxx and 1293.xxxx ranges of light guides have been developed into waterproof versions, IP68 tested by MENTOR. The key feature is the waterproof design through a special shaping of the plastic which requires a precise mounting hole C. The various options of light guide head and straight (0°) or diagonal (45°) injection faces are all still available in the IP68 range. 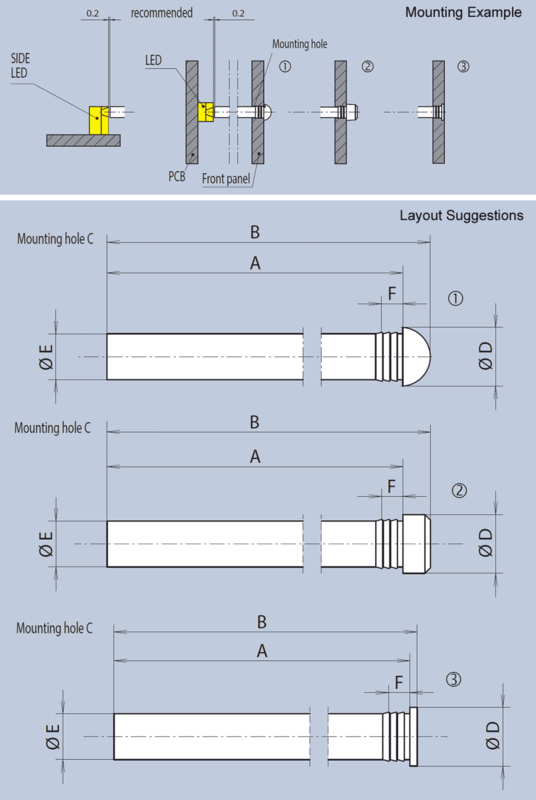 Custom Lengths A from 4.5mm to 100mm can also be supplied, often with little or no tooling costs. Versions using a special diffusing material to produce a frosted effect are available, as is self-colouring of the light guides. The latter allows the potential illuminated colour to be shown even when the LED is in an "off" status. The above servo controller manufactured by Moog Gmbh is fitted with MENTOR IP68 rated light guides. The image on the right shows a sample that has sucessfully operated under water for the past year. 45 46.5 1.6 H7 2.2 1.5 0.8 L1-L12 1292.5001 . 45 46.5 1.6 H7 2.2 1.5 0.8 L1-L12 1292.6001 . 8.3 8.7 1.6 H7 2.2 1.5 0.8 L1-L12A) 1292.1501 . 11.1 11.5 1.6 H7 2.2 1.5 0.8 L1-L12A) 1292.1601 . 45 45.4 1.6 H7 2.2 1.5 0.8 L1-L12 1292.1401 . 44.25 45.25 1.6 H7 2.2 1.5 0.8 L1-L12 1292.7001 . 44.25 45.75 1.6 H7 2.2 1.5 0.8 L1-L12 1292.8001 . 44.25 44.65 1.6 H7 2.2 1.5 0.8 L1-L12 1292.1301 .